Guest Blog post from Elaine Reynolds, game designer of Eden Isle: Resort Paradise (download the game on iOS here), a building sim game where you can create your dream resort. Ok so that’s not quite true but I have been told by many people that I have the dream job. I mean what could be better than playing games all day? Funnily enough, I’ve never heard anyone say that mechanics just look at cars all day or that chefs just look at food all day. There seems to be some sort of mystical aura surrounding game design. I often get asked how I got into games. When I say my route into games involved studying games at college, getting work experience and applying for jobs, I can sense a twinge of disappointment and surprise. I think they’re expecting something more mysterious, some sort of alchemy rather than a career route with steps that mirror those of many other career routes. Before I started making games, I thought that being a game designer was mainly about coming up with ideas for games. How wonderful to be a fountain of creativity coming up with an abundance of ideas, blessing the world with your brilliance absolved of having to do anything to see your ideas come to fruition! In reality, coming up with an idea for a game is the easy part. Famed game designer Peter Molyneux, who I was lucky enough to work alongside for a few years, was once approached by a fan who said “I have a great idea for a game”. Peter replied “I have a great idea for a painting”. As someone with embarrassingly bad drawing skills, I can relate to this! An idea on its own isn’t worth much. It’s a similar story with many pursuits – having an idea for a book, a business or a movie is the easy part. It takes time, skill, effort and most likely a great team to bring an idea to life. In game design, you could have 100 game designers all starting with the same idea for a game but they could take it in 100 different directions. When I came up with the idea for Eden Isle: Resort Paradise, I knew I wanted to make a simulation game, because that’s the game genre I love most and the reason I pursued a career in game development. I set up my studio, Simteractive, with the aim of making simulation games. I also wanted to create a game where you build your dream resort because I think a resort is a great setting – who doesn’t love hotels, swimming pools and palm trees? After this point, there were literally thousands of different decisions to make about the game – what causes guests to arrive at the resort? What are the game’s currencies and how does the player earn money? Does the layout of the resort matter? How do guests decide what to do? For each of these questions, the answer isn’t just a simple sentence, it’s a whole design doc with rules, flowcharts and excel sheets with numeric values that can be continuously tweaked. Being a game designer is about working out the details of each feature and also bearing in mind how fun it is for the player, how it fits in with the rest of the game, how easy it will be for the player to understand and solving problems that crop up along the way. There’s a tendency to idolise game designers and to view games as creations stemming from the creative powers of one individual pursuing their singular vision. However, games are made by teams – programmers, artists, animators, producers, musicians, testers, user interface artists and many more are involved in making games. Although there are many people who have made games all on their own, that means that they have to take on all of the roles involved in game development and wear many hats. Seeing a game go from being just an idea to a finished product that players enjoy is extremely rewarding. It’s also a long, arduous process. So even though the life of a game designer isn’t quite the fantasy world it might appear to be, it is amazing to see a game come to life. 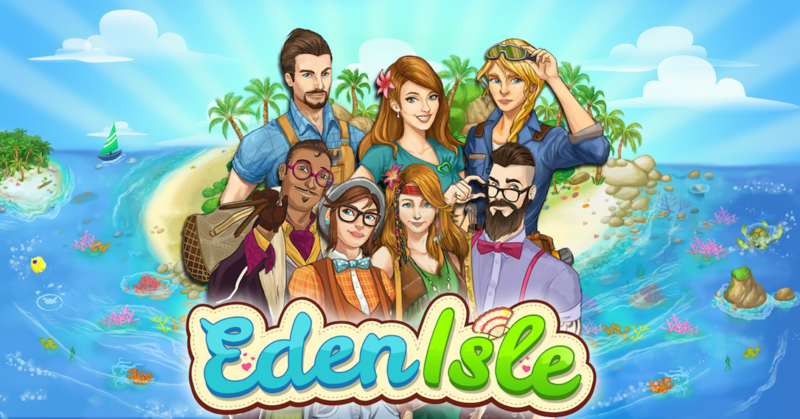 Eden Isle: Resort Paradise started as an idea to make a game that lets players create their dream resort. With a lot of work over a number of years and the efforts of a small, talented team, Eden Isle is available worldwide in the app store for iOS and enjoyed by players from all over. We’ve even won an award and been nominated for a few more but the best thing is when we get a review or a message from players saying they love the game. So back to the question of whether I play games all day? To be fair, I do spend a lot of time playing one game in particular – my own game, Eden Isle: Resort Paradise. However, when you’re playing games as a game creator rather than as a player, it’s literally a whole different game. For one thing, you’re rarely playing the final, polished version that players get to play. During development, games can be unrecognisable from their final form with features missing, no artwork or animations, placeholder user interface elements and major bugs. As a game designer you’ve got to see past all these issues to look at the core of the game. It’s a bit like on Project Runway when you see a designer pinning rough muslin cloth on their model showing the first inkling of the outfit’s design, the final form of which is still hard to visualise for the untrained eye. It’s the same when you’re designing the core gameplay for a game, you have to see past the missing artwork and look at the gameplay mechanics. Games should be fun to play even without any artwork. When I was designing Eden Isle, I first created a prototype with cubes for buildings and cylinders for guests (although I did put a sphere on top of each cylinder for the head to make them vaguely human-looking!). I worked out the game design using this prototype because if something is fun in such a rough state, it will be so much better once all the artwork, animations and bells and whistles are added. Another thing about playing your own game is that you play the same thing again and again and again. Luckily for me, I still love playing Eden Isle and creating a gorgeous resort, carefully choosing where I place each building, what decor items I choose and what path types I use. I feel a sense of loss whenever I have to delete a resort I’ve created in order to start again. When you play a game so many times you get to know it really well, too well in fact. Because of this, we love hearing from players as they experience the game differently. We read every single message that players send us and we really appreciate when players take the time to ask us a question or let us know about a bug that slipped through the cracks. The most important thing is creating a great player experience and responding to player feedback lets us do that. Elaine has kindly given me a handful of codes for free gems to give out, if you would like one then please email me: charlotte@thegirlwhogames.blog – it will be first come first serve so be quick!